CERAMIDE Series is a perfect solution for the revitalizaiton of damaged hair. The exceptional composition of CERAMIDE products strengthens the protective layer of hair, weak structure of hair and restores damaged hair. All products are vegan-friendly, do not contain sulphates, silicones, parabens and preservatives which would harm your body. We have the selection of the entire spectrum of shampoos, conditioners, masks and creams which are very gentle to your hair. 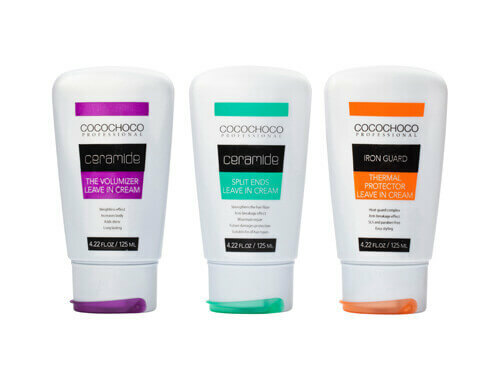 All these products can be also used as subsequent care after hair treatment by Brazilian keratin COCOCHOCO. Every day, our hair is affected by the external influence of weather, whether it is the sun, dry air or on the contrary moisture, fresh water and sea water. These influences always remove from our hair natural strength, elasticity and magic. We cannot also forget different chemical treatment and dying which makes damages to our hair as well. This series of products is based on a new and unique formula of composition combining CERAMIDE, natural oils and essential vitamins. 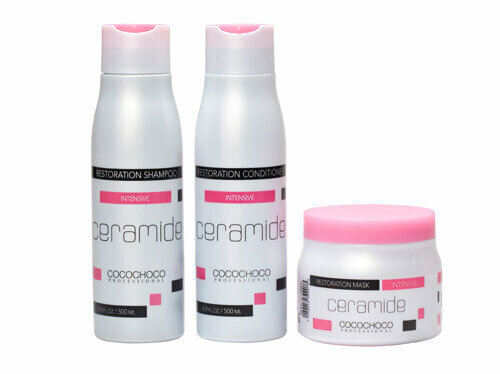 CERAMIDE COCOCHOCO products are developed for complete treatment of damaged hair. 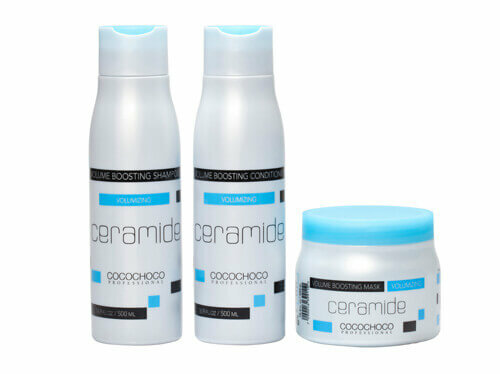 Each of CERAMIDE series is focused on different aspect or hair problem. CERAMIDE is a natural solution to the regeneration of damaged hair because it unifies space between the cells of external protective layer of a hair fibre. This unique process strengthens the protective layer of hair, restores damaged hair and strengthens the weak structure of hair. CERAMIDE acts as a "filling" enabling hair to restore the cell structure and protect the structure of soft hair fibres at the same time. In addition, it helps hair to maintain its natural moisture; due to this your hair will be soft to the touch. The series of CERAMIDE products for dry and breaking hair will help you to comb damaged ends easily, and create bright gloss. They contain natural herbal components which provide hair with complete hydration and prevent hair ends from repeated tangling. 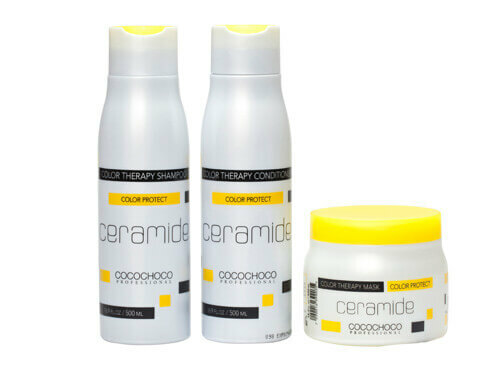 CERAMIDE for the protection of colour-treated hair will guarantee you the protection against loosing colour, washing out colour and instant hydration of hair. The new composition with natural components for hair revitalization is against loosing colour and at the same time, it gives hair velvet and healthy appearance. CERAMIDE for hair volume give the hair larger volume. Hair will look full and strong but still soft and fine to the touch. They are a unique solution to healthy and beautiful hair. CERAMIDE cream for split ends – Regenerates damaged hair fibres and wraps each hair root in a protective coating. The protective coating will protect your hair in everyday stress. CERAMIDE cream for the protection of thermally treated hair – Provides the maximum protection against thermal damage and at the same time, it smoothes hair to give it a perfect appearance. This professional cream instantly strengthens and protects hair when using curling tongs or iron. It also smoothes hair and prepares final styling. CERAMIDE cream for hair volume – Contains natural herbal components. When using every day, it enlarges hair volume and brings a feeling of lightness. All products from CERAMIDE series are enriched with the revitalization formula.